Welcome to the Wildland Fire Decision Support System (WFDSS)! Note: Click WFDSS Known Issues to see the list of the most current issues and suggested workarounds for WFDSS. This system assists fire managers and analysts in making strategic and tactical decisions for fire incidents. It has replaced the WFSA (Wildland Fire Situation Analysis), Wildland Fire Implementation Plan (WFIP), and Long-Term Implementation Plan (LTIP) processes with a single process that is easier to use, more intuitive, linear, scalable, and progressively responsive to changing fire complexity. WFDSS integrates the various applications used to manage incidents into a single system, which streamlines the analysis and reporting processes. Is a web-based application for easier sharing of analyses and reports across all levels of the federal wildland fire organization. Before you log into WFDSS, make sure you read and understand the system Rules of Behavior. 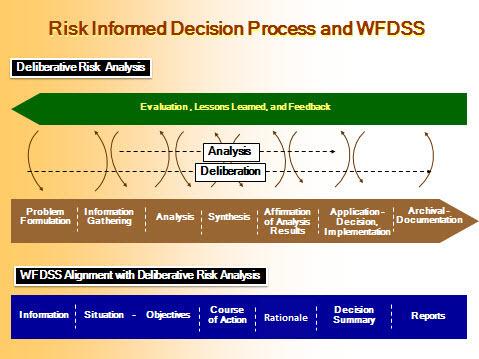 WFDSS follows an analytic deliberative process for decision making. The following graphic displays this process. Click here for further information. Last updated on 5/1/2018 2:30:26 PM.